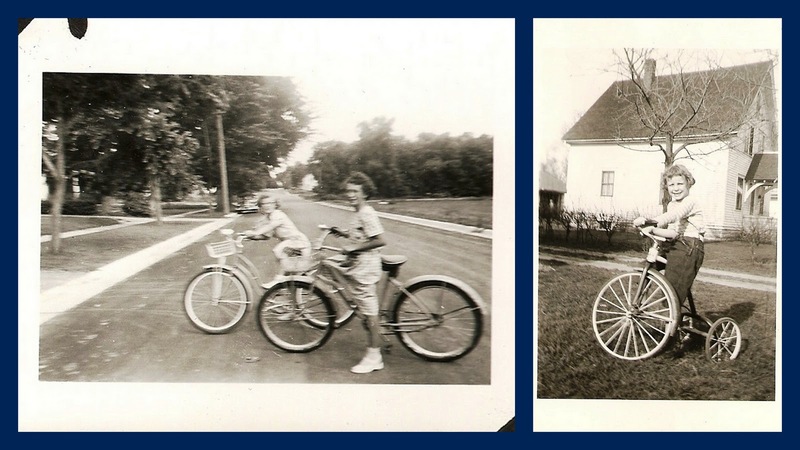 When having your own bike or trike was the best present you could get?? When your folks didn't worry about you riding around your neighborhood? When the neighbors or the milk man or grocery delivery man would tell your Mom where you were? I do. laughing the whole time, and that moment when you could ride with no hands on the handle bars, priceless...........if kids today would just play! I don't think kids felt the stress of growing up as much back than, our folks gave us the time to play and be kids. And of course no cell phones! We really did have more freedom back than, not as much organized time, our play time was ours, and we roamed the neighborhood freely. Don't think I would want my kids to do that now. But in a lot of ways kids nowdays have just as good a childhood as we did. Ah...the freedom of being a child so long ago! I got my first two-wheeler as a birthday present when I was eight. It wasn't new, my folks had bought it from a newspaper ad. I could ride anywhere in the neighborhood, but wasn't allowed to go across a street or ride in the street. Had to stay on sidewalks! Really slowed me down when the other kids could cross a street! I treasure the memories of all us kids in the neighborhood playing hide and go seek after dark on a summer's evening . . . game always cut short by our moms calling us in for the night! The little store on the corner across from us...Penny candy that really was a penny, fudgsicles for a nickle, 50 cents for the movie and a drink and a snack. The sheriff and deputies making sure that the bully down the street kept his hands to himself because the bullies parents also knew that the kid was a bully and needed some outside direction. We had it good, but our kids also had it good and our grandkids (no matter how much we complain about the tech that they use consistently) have it good as well. The times they are a-changing but the young people will one day look back and say, "The good old days". I Agree, but in those days we were happy with a piece of cardboard to go sledding down a hill when there was snow. didn't have a sled or other fancy sleds. were happy with things that didn't cost alot of money. we made do.